The reinstatement of compulsory military service in this context of growing tensions is meant to be used for social control. 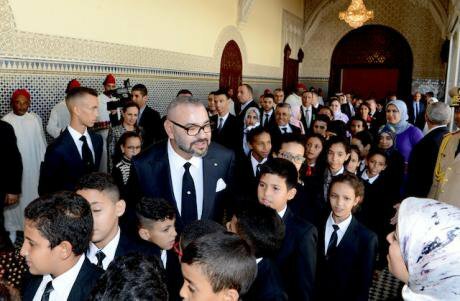 Morocco's King Mohammed VI attends a reception in honor of young students, during presentation of the progress report on Supporting Schooling, at the Royal Palace in Rabat, Morocco on September 17, 2018. Picture by Balkis Press/ABACA/ABACA/PA Images. All rights reserved. Chaired by the king, the council of ministers enacted a controversial bill on mandatory military service on August 20. The bill targets young citizens aged 19 to 25 and deemed fit to serve, triggering debate about the issue on social media. Critical voices expressed their worry and suspicion of what lays behind. The “Moroccan Rally Against Mandatory Military Service”, a Facebook group gathering thousands of young Moroccans, released a statement August 28 signed by a number of civil society organisations and activists, announcing their disapproval over the draft bill. The Democratic way party, the Youth of the Democratic Way and the Youth of the Socialist Democratic Vanguard also released statements denouncing the bill. A statement by the Royal Cabinet stated that “military service aims to promote patriotism among the young, within the framework of the correlation between the rights and responsibilities of citizenship”. In a televised speech to the Nation last November, the king had emphasized “the ideals of true patriotism”, “the spirit of loyalty to the nation’s sacred values” and “sacrifice to the homeland”, where he also expressed his unequivocal support for “the Royal Armed Forces” and “security services,” and his appreciation of “their action, sacrifice and constant mobilization,” and again on the following speech on Throne Day last July in which he commended the “Royal Armed Forces, the Royal Gendarmerie, the Auxiliary Forces, the National Security Forces and the Emergency Services on being constantly mobilized, under [his] leadership, to defend the nation’s unity and safeguard its security and stability”. The palace's praise for the Royal Armed Forces and security services comes after a vast crackdown on popular mass protests, which reverberated across the Rif and other regions over the last couple of years. These movements have faced mass arrests of young leaders and heavy sentences for their participation in the protests. Hirak leaders were accused of undermining state stability and its territorial integrity, thus ignoring the police’s brutal handling of the protests and the allegations of torture supported by forensic doctors’ reports. One could only conclude a will to make clear the repressive approach with which any social contestation will be dealt with. In parallel to the bill on Mandatory Military Service, the council of ministers approved a draft law on education, adopting “a new governance model based on contractualization”, “the integration of pre-school education”, a new “funding regime of the educational, training and scientific research system” and the “establishment of evaluation and monitoring mechanisms” according to the statement by the Royal Cabinet. Such educational reforms have been discussed on several occasions. Following the Council of Ministers, the king delivered a televised speech where he criticized how the “education system [continues] to produce unemployed people, especially in certain branches of study, where graduates - as everyone knows - find it extremely hard to access the job market” while “many investors and businesses are having difficulty finding the skilled resources they need in a number of trades and specialized sectors”. The incompatibility of the educational system with market needs has disturbed not only the Palace but also international financial institutions; A World Bank document entitled ‘World Bank engagement in the Education sector in Morocco’ outlining the institution’s financial and consultative involvement in reforms of the sector has called for the “adaptability of education” and an “overhaul of the education system” through almost the same measures mentioned by the royal statement, These include improving “teacher recruitment and training”, a new “governance structure”, giving priority to “early childhood development”, “private sector participation” and “linking education and accountability”. Since the introduction of structural adjustment programs in the 1980's the Moroccan state has embarked in a process of economic reforms dictated by international financial institutions, particularly the International Monetary Fund and the World Bank. These reforms focused mainly on promoting growth by imposing policies of monetary and fiscal austerity, privatisation and financial liberalisation. On the other hand, social provisions and social safety nets that are perquisites for successful economic reform and political stability are undermined by these same policies. An internal World Bank report entitled ‘The Effect of IMF and World Bank Programs on Poverty’ concluded that “Adjustment lending is bad news for the growing economy; it means that the poor share less in the expansion of the economy” and that “lowering the sensitivity of poverty to the aggregate growth rate could be dangerous because it gives the poor less of a stake in overall good economic performance”. The ruling elite in Morocco seems to be more accountable to the country’s debtors and less to its people. Hence, the given solutions to the country’s challenges seem to only find an echo within the above mentioned financial institutions. Green growth agendas, private sector-led competitiveness and global integration are flattering the debtors which applaud the country’s macroeconomic improvements. At the same time, the government is constantly reminded it of its commitment to implement more structural reforms in education and to improve the business environment, even if it means feeding the wealth gap and threatening social security. What matters at the end of the day is that it benefits the donors’ neo-colonialist exploitation of the country’s resources and that the money keeps flowing. The first years of Hassan II’s reign were those of political instability and strong opposition to the despotic tendencies of the previous monarch. After announcing educational reforms which prevented students above the age of 17 from attending high school, student unrest escalated in different cities. In Casablanca, a student-organised protest devolved into three days of street battles on March 1965. Involving, in addition to students, thousands of workers laid off during the 1964 economic recession, as well as inhabitants of Casablanca’s shanty towns. The palace reaction by deploying the military, and using live ammunition against unarmed civilians, resulted in hundreds of deaths. The former king then vented his anger on the educated youth, declaring in a televised speech: "Allow me to tell you that there is no greater danger to the State than a so-called intellectual. It would have been better if you were all illiterate”. A mandatory military service was established the following year, and was widely used against political opponents as a means of punishment. Students of the executive committee of the 10th congress of the National Union of Moroccan Students were drafted, as well as those who organised the occupation of the Moroccan Embassy in Paris in solidarity with them. The high percentage of unemployment amongst university graduates in the country is a source of worry for the Palace. Another point of contention is the high drop-out rates in secondary schools, a result of a growing disappointment amongst young Moroccans who no longer see education as a guarantee of future employment. Unemployment among youth has not been addressed seriously and remains high at about 20%. The outcome of this state of affairs could prove costly for the relative political stability enjoyed by the regime, as the recent tensions in the Rif and elsewhere have demonstrated. Military service has once proved efficient in repressing the spirit of rebellion and assimilating dissatisfaction and anger among the young. Since the recruits are cut off from their society in a ‘total institution’, where they are subjected to a fully administered round of life. The process is basically one of acculturation during which the trainee experience physical and psychological stress and enforced environmental change, and must adapt to different social norms of military discipline and unquestioned obedience that are fostered in the course of military training and reinforced by the structure of the military authority. The reinstatement of compulsory military service in this context of growing social tension while maintaining the same economic and social policies that caused it, the repressive approach towards social movements, the unconditional praise of the military and security services and the fact that the professional army isn’t practically in need of any reserves are sufficient to conclude that it is meant to be used for social control, and could even mean a coming back of the military to the scene, to bring back order in future escalations of social unrest.